My sixth book for this year’s Nordic challenge is the third Liza Marklund book I’ve read so far this year. I have become quite transfixed by the insight the books offer into the Swedish political and social history as well as the character of Annika Bengtzon, whom I don’t always like but do find compelling. Newspaper journalist Annika Bengtzon has turned down a senior editor’s job so that she can continue investigative journalism. Having prepared a series of articles on terrorism she plans another on the anniversary of an attack during which a man died which happened in 1969 at an air force base in the far north of the country. No one has ever been convicted over the attack but local journalist Benny Ekland seems to have some new information so Annika flies to Luleå to meet with him. When she arrives she discovers he has died and she learns from speaking to an eye witness the police have not found that his death was the result of a deliberate hit and run. Through her connections at the highest levels of the police she also learns that their suspect for the ’69 attack was a local left-wing activist known as Ragnwald who, they believe, went on to become a ‘terrorist for hire’ in Spain and France. When Ekland is killed and other deaths follow everyone wonders if Ragnwald has returned and if so, why? It is Annika who joins the dots in this fast-paced story. I have to admit that this book isn’t really the best work of crime fiction you’ll read, in that the crime does not always take centre stage. Marklund is at least equally, if not more, concerned with using the crime and its investigation as a backdrop for the exploration of a range of social and political issues. Fortunately for me I found these utterly fascinating and so did not mind terribly that the crime was dealt with in a more perfunctory way than I might normally look for. That doesn’t stop me from regretting the way journalism is going. Along with the other tabloids we’re writing about reality television as if it was the most important thing going on right now. Now that can’t be right, can it? If it hurts me as a reader to see the drivel that a significant percentage of news media content has turned into, I can only imagine how deeply it must affect a journalist like Annika (and Marklund who is herself a journalist). The other aspect of this novel that had me gripped was its insight into Swedish political history, a subject about which I am woefully ignorant (now maybe slightly less so). I had always known vaguely that Sweden’s political environment was a more left-leaning one than I am familiar with, but I had no idea just how this had played out over time. The use of an attack in the 60’s gives Marklund the chance to explore her country’s political environment at that time, something done deftly via the character of Berit who is Annika’s mentor at the newspaper. She has been involved with left-wing politics for much of her life so able to provide interesting background. Australia’s political scene is largely tame and centrist so I am always intrigued by societies that have a different kind of political history. As always Annika Bengtzon is a troubled character and, as always, I spent a good portion of the book not liking her actions. I have never found her dull or unbelievable though, even when I’ve been disappointed in her behaviour. She is still dealing with the mental fallout from the events in the previous book in the series* which manifests itself in a variety of ways including anxiety attacks and the voices of kind angels in her head. Now there are rumblings from her boss that she may not be able to continue working on the kinds of stories she wants to do. On top of that she encounters yet more marital problems and it was her handling of this aspect of her life that I found objectionable, though I repeat it was entirely credible. The author’s note at the end of the copy of the book I read made particular mention of this in that Marklund was widely exploring the theme of people abusing their power and she wondered if Annika would also do so in the right circumstances. Would we all? For me the best crime fiction does what Marklund has done here: combine a compelling plot with insight into some aspect of politics, history or society in general. While finding out ‘whodunnit’ is interesting, it is never as satisfying as finding out why. When this is played out against a backdrop of general social commentary it is the most satisfying of all. Red Wolf has been reviewed all over the place including at Crime Scraps, Euro Crime (where Norman and Maxine both enjoyed the novel very much) and The Game’s Afoot (where Jose Ignacio was not so taken with the adventure). I have reviewed two of Marklund’s earlier books, Studio 69 and Prime Time. *A book called The Bomber which has already been published in English in Australia and the UK (possibly also the US?) 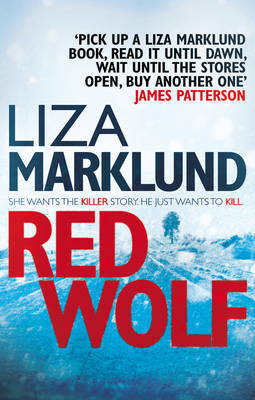 some years ago but which in my copy of Red Wolf is spruiked at the end as “The next Annika Bengtzon thriller”. Make of that whatever you like. 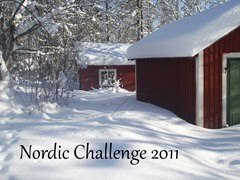 This entry was posted in book review, Liza Marklund, Nordic Challenge 2011, Sweden. Bookmark the permalink. An excellent review Bernadette, and you made some interesting points. Bernadette – Oh, I’m so glad you enjoyed this one! I like Annika Bengtzon very much and although, as you say, she’s not always pleasant, she is a fine character. She’s real. You make such a good point about that. And I like the way Marklund shows us politics in this novel, too. And thanks for making that great point about modern journalism :-). An excellent review! Well, I liked this book because it offered something other than a routine mystery. The story was wild, and the protagonist, Annika Bengtzon, very unusual, to say the least. I, who was an activist in the 1960s, and still keep a hand in (or an eye by reading), and have never met nor heard of folks like the culprits in this book in the U.S., am quite surprised by this part of Swedish history. I probably should read some of Marklund’s sources before I form an opinion on this. However, what drew me in was Annika’s complexity, backstory and current family, career and personal problems, including her demons. I want to know more about her. When I was at the computer while still in the middle of the book, I felt the book calling me to come and read. I thought of it until I was finished, always a good sign. Bernadette – I’m very pleased that you enjoyed Red Wolf! Fans of Liza’s books will be busy in 2012 – also due for publication in spring 2012 is my translation of the next instalment of Annika’s story, published in Swedish as Nobels testamente (Nobel’s Last Will – although I understand that the book is likely to be retitled in English). Then there will be a further instalment published in the autumn of 2012! At the moment I’m not entirely sure which of these translations will be published in the US or Australian markets: ‘Nobel’ should certainly be appearing in the US towards the end of 2011, and hopefully the others will follow in due course. Right, must get back to work on ‘Nobel’!